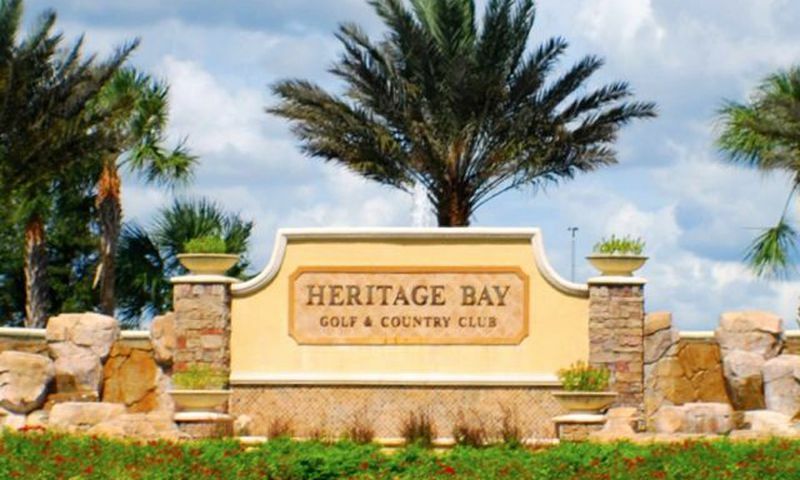 Heritage Bay, located in North Naples, is a golf and country-club-style community. Homeowners enjoy golf equity at the community's 27-hole championship Lewis-Azinger designed golf course. Tennis enthusiasts can play at one of seven Har-Tru courts and purchase necessities at the tennis pro shop. The amenities continue at the spacious 27,000 square-foot clubhouse, complete with both casual and formal dining. Heritage Bay's variety of both single-family and attached homes offer many options for homeowners. With 550 acres of open space, 80 percent of the homes at Heritage Bay offer prime views of the beautifully maintained golf course or preserved nature. There are 1,400 homes within Heritage Bay's secure gates, making it a comfortable medium-sized community with an abundance of amenities. In the 27,000 square-foot clubhouse, residents can also enjoy billiards, play a game of cards, join one of the social clubs, or read in the library. The Grille Room provides residents with both casual dining while the main dining room is for more formal dinners. Residents can enjoy lunch or a quick snack by visiting Chickee Hut located near the pool. Heritage Bay's large state-of-the-art fitness center is complete with an aerobics studio. A day spa with a salon and massage room are also available. Heritage Bay is an ideal location for golf enthusiasts. In this country club setting, all homeowners enjoy golf equity, or packaged golf, at the community's 27-hole championship golf course. This beautiful and challenging, hand-mowed course was designed by Gordon Lewis and Jay Azinger. With three nine-hole courses: The Pine, The Cypress, and The Oak, residents can play various combinations for a total of 7,200 yards over 18 holes. Five sets of tees make the course flexible for all skill levels. Second only to golf, tennis is a popular passion among Heritage Bay residents. The community offers seven lighted Har-Tru tennis courts, including a grandstand center court, and a tennis pro shop. The activities do not end with golf and tennis. Residents also love swimming and relaxing at the outdoor resort-style pool and spa as well as five satellite pools throughout the community. Residents can enjoy 550 acres of open space, scenic lakes and manicured walking, and biking trails. Heritage Bay offers many choices when it comes to home style, including both attached and detached homes. Single-family estate homes are one-story and each includes four bedrooms, three bathrooms, and a three-car garage. There are four models of single-family homes available in a range of sizes from 2,361 to 2,926 square feet. Coach Homes are two-story four-plexes, which means there are four homes in each, two upper and two lower units. First floor units are 1,883 square feet, while upper units are a bit larger at 2,099 square feet. Coach Homes each have three bedrooms, two bathrooms, and an attached two-car garage. Condominiums at Heritage Bay are available in two designs. Terrace Condominiums are found in a four-story building with elevators. There are three models of Terrace Condominiums available, ranging in size from 1,883 to 2,099 square feet. Each of these condos includes a covered lanai and a carport. Veranda Condos are another option for condominiums in Heritage Bay. There are 12 units in each building of Veranda Condos, six upper and six lower units. Each unit has a detached one-car garage. Lanais are found at the front and back of the building. Heritage Bay is open to all ages, and its amenity-rich country club lifestyle is designed with discerning homebuyers in mind. Whether playing golf or tennis, swimming, or exercising at the state-of-the-art fitness center, Heritage Bay residents have many options for staying in shape. Outdoors, the walking and biking trails allow residents to enjoy the open spaces and views of the many scenic lakes. Heritage Bay employs a full-time activities director to help residents arrange their recreations, plan excursions, and find suitable social clubs. Residents will feel as if they are living a vacation as they take part in the community's various amenities and enjoy both the casual and formal dining available within the spacious clubhouse. Located in North Naples, Heritage Bay is only a short drive from sandy Gulf coast beaches, shopping, dining, and recreational attractions. Nearby, Coconut Point and Gulf Coast Town Center each offer exceptional retail and dining options. The Big M Casino, in Fort Myers, is located only twenty minutes away. Heritage Bay's convenient access to I-75 makes it easy to visit Naples, Fort Myers, or other surrounding areas. Residents who often travel or have out-of-town guests will enjoy living only 25 minutes from the Southwest Florida International Airport. With its prime location, Heritage Bay residents can enjoy both on-site amenities and all that is offered at nearby Naples and Fort Myers. Clubhouse - 27,000 Sq. Ft. There are plenty of activities available in Heritage Bay. Here is a sample of some of the clubs, activities and classes offered here. Terrace Condominiums are found in a four-story building with elevators. There are three models of Terrace Condominiums available, ranging in size from 1,194 to 1,408 square feet. Each of these condos includes a covered lanai and a carport. There are 12 units in each building of Veranda Condos, six upper and six lower units. They range from 1,414 to 1,661 square feet and each unit has a detached one-car garage. Lanais are found at the front and back of the building. Coach Homes are two-story residences with two upper units and two lower units. First floor units are 1,883 square feet, while second floor units are 2,099 square feet. Coach Homes each have three bedrooms, two bathrooms, and an attached two-car garage. Single-family homes are one-story and have three or four bedrooms, two to three bathrooms, and a two or three-car garage. There are four models of single-family homes available in a range of sizes from 2,361 to 2,926 square feet. I moved to Heritage Bay one year ago and have been enjoying my new condo lifestyle. NO maintenance! No more mowing the lawn or taking care of the flowers. I love the views from my 4th floor condo (and there is an elevator too so it's easy to bring up my groceries). It's been a great move for me to downsize here. The clubhouse is very elegant and beautifully decorated. I enjoy spending time there. 55places.com is not affiliated with the developer(s) or homeowners association of Heritage Bay. The information you submit is distributed to a 55places.com Partner Agent, who is a licensed real estate agent. The information regarding Heritage Bay has not been verified or approved by the developer or homeowners association. Please verify all information prior to purchasing. 55places.com is not responsible for any errors regarding the information displayed on this website.